Redirect expenses awaiting your approval to a different Approval Flow/Approver. 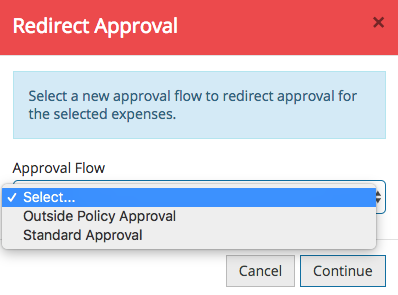 As an Approver you have the option to Redirect Approval of a Users Submitted expenses to a different Approval Flow. Please note, the ability to redirect expenses during approval is only available via the web portal. 1. Click on the Users name to expand to see all expenses. 2. Select the expense(s) and click either Redirect Approval buttons. 3. Select the different Approval Flow from the Redirect Approval box. 4. Click Continue to send the selected expenses to a different Approval Flow/Approver. If the Redirect Approval buttons are not visible to you, please speak to a member of your Finance Team and ask them to enable this option for Approvers in your company.